Hayes & Yeading United came back from Dorset without success in a game which was clearly more significant to the home team as Dorchester’s three points will go towards their unlikely bid to escape relegation and the home side were clearly motivated to acquire them. But Dorchester aren’t in the position they are in without reason and for most of the first half, Hayes & Yeading United showed superior quality in their approach play. 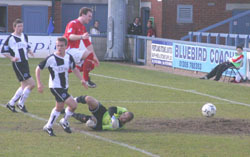 However, home goalkeeper Chico Ramos had a fine game and was determined not to concede the first goal. Four minutes in, Staforde Palmer laid the ball off to Will Hendry on the edge of the area and the midfielder’s firm shot was spilled by Ramos who recovered well to smother the ball. United continued to look threatening, Ram Marwa collected the ball from Kieran Knight and curled it towards goal but it lacked enough height to seriously trouble Ramos. Then a fine passing move created a lot of space for Toby Little on the left flank. His low cross was just behind Palmer but his flick on landed in Knight’s path. His firm shot was well blocked by Ramos, as was his rebound effort from point blank range. 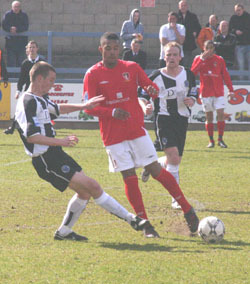 From the resulting quickly taken corner, the Dorchester defence was left napping and Danny Allen-Page picked up a short pass and advanced towards goal, but his shot towards goal was blocked by Patrece Liburd and eventually cleared. Knight headed Allen-Page’s cross just over the bar as United threatened to overrun the home side but that was to prove to be the point where Dorchester began to settle and Jones Awuah fashioned their first half chance with an athletic overhead kick which Alessio De Angelis caught. Minutes later, Nevin Saroya misheaded Jon Docker’s free kick but De Angelis was alert enough to thwart Liburd’s attempt to turn the ball in. Ramos was called back into action in the 36th minute when he blocked Hendry’s volley from a tight angle and from another quick corner, Hendry crossed to Marwa who headed just over from close range. Dorchester scored the only goal of the game somewhat out of the blue four minutes before half time. A harmless looking goal kick from Ramos found its way to Docker who advanced to the edge of the area before curling an inch perfect shot past De Angelis and just inside the far post. Jake Smeeton hit the cross bar within seconds of the restart but following that, the second half took a long time to get going. Adam Thompson lit it up with an amazing surging run through several Dorchester players including a one two with Knight and his final volleyed attempt was just wide of the post. Substitute James Mulley got forward a fair bit on the right after coming on and his first cross was turned on by Palmer to Knight, but first he shot straight at Forbes and then hit the rebound well wide. United went close to an equaliser in the 70th minute but also nearly went two down. 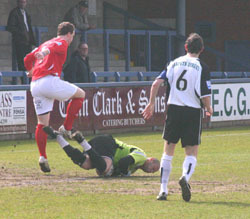 First Palmer’s deflected shot looked certain to go in until Ramos produced another fine reaction save with his legs, then from Gary Bowles’s long clearance, the play quickly switched to the other end as Docker bore down on goal only for his shot to be acrobatically saved by De Angelis. Saroya headed Hendry’s corner inches over soon afterwards and once again, Dorchester counter attacked at pace with speedy winger Ivan Forbes cutting inside before laying the ball off to Smeeton whose shot just missed the far post. 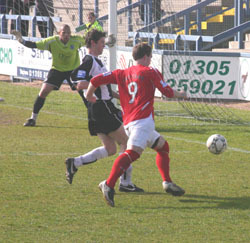 Mulley crossed for Hendry whose goalbound volley was blocked by Bowles but again, Dorchester broke through Forbes and this time he went all the way himself before scuffing his shot wide. At the end, Marwa tested Ramos again, but the man of the match was able to hold onto his 20 yard volley and Dorchester comfortably played out the rest of the game to claim a vital three points in their quest to survive the drop.